Fear is an emotion that every single one of us has experienced at many points in our lives. It's a natural reaction to feel afraid and no matter what you call it; dread, horror, alarm, terror, panic, distress, fright, or threatened, it'll always have a negative connotation. However, not all fears are bad and it's actually quite healthy to feel afraid every now and then. For most people, things like creepy crawlies or heights freak them out. According to various surveys on the topic the most common fears and phobias have to do with snakes, spiders, cockroaches, public speaking, needles, tight spaces, flying, dogs, water, germs, and death. While people can be afraid of virtually anything and everything, they can only fear on thing the absolute most. What are you the most afraid of in this world? Put another way, what's the one singular thing, thought, or idea that is truly capable of filling your mind, body, and soul with dread? No one likes to admit it, yet we all have to face what it is that we fear the most. While it's natural to instinctively repress and avoid the unpleasant thoughts, we eventually need to deal with it and what better way to do just that than with some basic psychology! This quiz uses ink-blot images to draw out and assess your deepest, darkest subconscious fears and thoughts. What you end up seeing in each picture ultimately depends on your perception of the world. In turn, part of what molds and shapes your interpretation of all the things that you see and come across in life is your unconscious mind. It's usually inaccessible, which is why psychologists have developed tests like the one featured here to draw out and uncover the ideas and information it holds deeply hidden. Projective tests, which include ink-blot tests, are psychological tools that use images, words, or situations to analyze how people respond to them. An individual is assessed in terms of the unconscious personality traits they exhibit towards the stimulus, in this case the image, and from their response hidden emotions are brought to light. 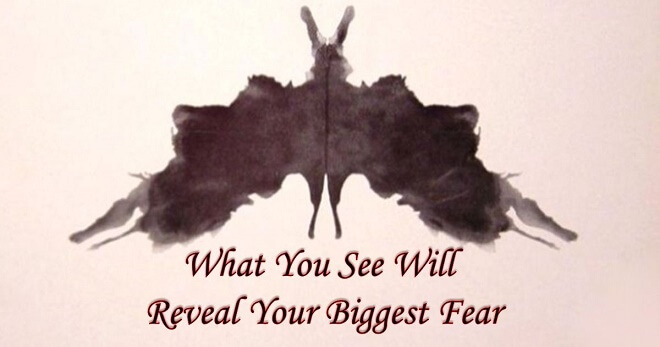 In other words, how you view the ink-blots here will reveal what you fear the most. With that in mind, are you ready to face your biggest fear? Take this projective ink-blot quiz now and see whether or not you agree with the end results. Enjoy!